Information on illegal digging led to the discovery of the archaeological sites reported in the present publication. Clandestine and destructive activities left their traces at a number of sites in the vicinity of the city of Kateríni north of Mount Olympus, a region which is characterised by low hills and known to the local population under the name of Adhrianós (Adrianós, fig. 1). The first site to be discovered was a cemetery of historical times, probably of Classical or Hellenistic date (fig. 2). In one of their holes, the illicit diggers had left an iron sword in place. A first reconnaissance revealed traces of ancient frequentation on most of the hills around Kateríni. This frequentation dates at least from the Roman and Byzantine periods. Clear indications for earlier human activity could be located mainly in the Adhrianós region southeast of the village Neokaisária. Apart from the cemetery, where the sword was found, there is a second, more extensive necropolis 2 to 3 km to the west (fig. 2). At this site, deep ploughing had uncovered the covering slabs of two early Hellenistic tombs. In one of them two vessels were found in situ close to the skeleton. A third cemetery, probably of Early Iron Age date, is situated close to the second one (fig. 2). Moreover, according to information collected among the local population, tombs were also found in other localities, in the neighbouring valley and on the Adhrianós hills. A settlement site with diachronic habitation is located between the aforementioned burial grounds, close to the river Mavronéri or Aisōn (fig. 2), as it was known in Antiquity. Although this is not the only site of the region inhabited prior to the Roman period, it is for sure one of the most favourable ones for settlement. Today it is referred to as “Kástro” by the inhabitants of the surrounding villages (fig. 3). The Kástro site stands out in its size amongst the other ancient settlements in the region of central Pieria, which are located on hilltops or on the flanks of the hills on both sides of the Aisōn river. It covers 1.4 ha and is situated on the flat top of a steep hill, next to the river side (fig. 4). It is probably no coincidence that there is a concentration of a considerable number of settlements of different time periods around the Aisōn valley, to the west of Kateríni. Coming from Platamónas, one meets here the first low hills in front of the Olympus and the Pieria mountain range. In the alluvial plain of Kateríni and in the coastal plain east of the Olympus, which was ravaged in ancient times by its torrents, very few pre-classical sites with continuous habitation are known today. It needs to be stressed that the Aisōn is the largest river in Pieria and one of the few, which does not dry up even in the summer. Its valley is used as a main route leading from the Thessalian region of Elassóna towards the Thermaic Gulf and Central Macedonia (fig. 5). It was probably this region, between the rivers Aisōn and Leukos (today’s Pélekas) and in front of the Adhrianós hills, which was chosen by Perseus for setting up his camp and waiting for the decisive battle against Aemilius Paulus (Plutarchus, Aemilius Paulus 16.7.1–16.9.3; 21.6.2–21.7.1). As said above, the ancient settlement, which is situated among the Adhrianós cemeteries, is known today as Kástro, just as many ancient fortified sites all over Greece. However, it is possible that it bore the same name during the Byzantine period, if the introduction of a Byzantine inscription found at the site and naming “ΤΟ ΚΑΣΤΡΟΝ” refers to this very site (fig. 6) 1. The preservation of the name “Kástro” in people’s memory until recent times is due to the existence of a fortification wall built of large ashlar blocks. In the years between World Wars I and II that wall had been demolished by refugees from the neighbouring villages. At some places of the settlement and perhaps in the same line that is followed by the aforementioned wall, another fortification of more recent date is better preserved. It is built of river pebbles, often with the addition of lime mortar. Older people still remember that before the war this fortification was still preserved to a considerable height and, thus, could be used by the villagers to shelter their horses. Naturally, all kinds of treasure hunters had already shown interest in the site, often even by using mechanical diggers. In addition, the destruction was enhanced each year by deep ploughing at the sites in the settlement and the cemeteries. For this reason the later, mainly Classical and Hellenistic settlement phases are not preserved in several locations of the inhabited area. The imminent destruction of a settlement of long duration and the constant plundering of the extensive nearby cemeteries led us to conduct a small-scale excavation in November and December 2007, which took place under the auspices of the XXVIIth Ephorate of Prehistoric and Classical Antiquities. Considering the gaps in knowledge concerning the archaeology of the region (cf. Andreou, Fotiadis, and Kotsakis 2001, 295–298; Jung 2002, 36–41, 242–243), one can understand the important contribution that the excavation of a diachronically inhabited settlement site in Pieria can offer. During the excavation two small trenches were opened, one on the highest spot of the hill and one approximately in the middle of the flat lower part of the settlement (fig. 7). The lowest archaeological layer on top of the natural subsoil contained Early Bronze Age material in both trenches. No post holes or remnants of walls dating to this period were uncovered in any of the explored areas. In trench A1, on the top of the hill, a pebble-strewn surface was partly preserved. In contrast to that, in trench B1 the remnants of this early phase consisted mainly of pottery. Bowls with simple inturned (fig. 8,1.2) or inturned T-shaped rim (fig. 8,3) and vessels with tunnel handles (fig. 8,5) belong to the most characteristic EBA types. Some of these finds, namely the closed vessel with slightly concave neck (fig. 8,4), the T-rim bowl (fig. 8,3) and the bowls with pronouncedly inturned rim (fig. 8,1.2), find better comparisons with pottery from the coastal Thessaly (e. g. from Pefkákia Maghoúla, see Christmann 1996, pl. 22.16, 32.4, 41.21,24, 56.18, 62.18, 64.5) rather than to the ceramic repertory of Central Macedonia (cf. Aslanis 1985). At Síndos west of Salonica some bowls of the EBA pottery deposit do have a pronouncedly inturned rim like the ones from Kástro (Andreou 2000, 77 drawing 4.1,4; Alram Stern 2004, pl. 67.1,4), but other types such as the bowls with inturned and T-shaped rim are not present. The aforementioned types from Kástro can be approximately dated to EH II, since the best parallels for them can be found in EBA Phases 5 to 7 Early of Pefkákia Maghoúla (cf. Christmann 1996, 193–198, 323; Alram-Stern 2004, 760–761). Indications for the next period of use on the Kástro site are numerous sherds of handmade pottery dating to the LBA, which, however, were found in disturbed layers, mainly in the upper trench A1. The quality of the fine ware pottery, unpainted (fig. 9,1) and matt-painted, is worth mentioning. Vessels are well fired and very hard. Some of the decorative elements like the motifs incised on top of the matt-painted surface of one body-sherd (fig. 9,2) testify to the existence of a specific local style. The matt-painted vessel repertory of the Kástro settlement includes kantharoi (fig. 9,3 and probably also 4) and amphorae (fig. 9,5–7). These matt-painted vessels compare better to the stylistic group of the Axios river than to the one of the Haliakmon river – both in terms of the monochrome paint and the decorative motifs used (cf. Horejs 2007a, 299 pl. 77a; eadem 2007b, fig. 2 [on this website]). At present it is not possible to say, whether the absence of Mycenaean pottery is due to coincidence or whether the LBA frequentation of the Kástro hill should be dated to the earlier phases of this period, before the production of Mycenaean pottery started in the region. 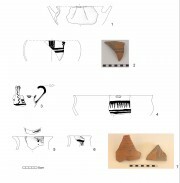 The absence of incised and incrusted pottery among the ceramic repertory of the settlement confirms Βarbara Horejs’ observation that this typically Balkan ceramic category was not in use south of the plain of Yannitsá (Horejs 2007a, 297–298 pl. 76a). The chronologically subsequent settlement period of the site is the Early Iron Age, from which more building remains are preserved. In the area exposed by trench B1 a layer of little more than 0.50m had probably been deposited by the inhabitants not only to level the sloping surface of the hill but also to support several large pithoi (fig. 10 and 11). Only one of these pithoi was uncovered in situ, while the remnants of a second one were found next to it. It was probably hit by treasure hunters. The following observations lead us to believe that the layer, into which the pithoi were inserted, had been deposited on purpose: 1) its considerable thickness and homogeneity, 2) the small size of the sherds found in it, yielding only few joins, 3) the absence of any indication of a floor/use level within the layer, confirmed by the trench section, and 4) the absence of any building remains. At one point, a stone foundation for a mud-brick wall had been constructed on top of the terrace fill in the lower trench (Fig. 12). In the room, probably delineated by the wall exposed in the trench, a group of more than ten clay spools was found (Fig. 13). They belong to a type, which came into use both in the Mycenaean south and in Macedonia during the LH IIIC Developed phase and which may be interpreted as loomweights (Rahmstorf 2003; Alram-Stern 2006, 128–129 pl. 30.104–107; XIX.104–107; Evely 2006, 296–298 with fig. 5.15–5.16 pl. 98). In Macedonia they became very popular in the course of the PG period, judging by the stratigraphy at Kastanás (Hochstetter 1987, 90–91 fig. 16 pl. 22.1–3; 36.17–18; Hänsel 1998, 194 fig. 78.2; 206 plan 16 [Level 11]: squares W 44–45). Later, these spool-shaped loomweights are attested throughout the EIA and possibly even into the Archaic period 2. The fragmentary character of the pottery and the types of wheel-made vessels represented in the terrace fill and in the house context on top of it allow neither a very detailed typological evaluation nor an assessment of the chronological differences between these two stratigraphic layers. At present, a clear chronological difference between the terrace and the overlying building phase cannot be discerned based on the pottery record. The pottery from both layers dates roughly from the LPG until the beginning of the SubPG and belongs to types common in the Northwest Aegean (cf. Gimatzidis, in press a). Skyphoi with pendent semicircles or concentric circles (fig. 14,1–3) were used from the LPG onwards (Desborough 1979–80, 298–301; Gimatzidis 2006, chapter 3.5.1.1.8). The Mycenaean-type skyphos (fig. 14,4) found in the layer with the loomweights perhaps gives a hint at a more precise dating to the LPG (for the prolonged use of Mycenaean skyphos types in EIA Macedonia cf. Jung 2002, 87, 102). In the same layer several fragments of the so-called transitional types of north Aegean neck-handled and belly-handled transport amphorae were found, which are decorated with concentric compass-drawn circles and cross-hatched triangles (fig. 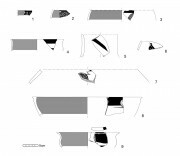 14,6–7) (for north Aegean transport amphorae see Tiverios 1996, 416–417, 424 fig. 7; Catling 1998; Gimatzidis, in press b). A few sherds from disturbed layers show that the Kástro site might have been in use also in later phases of the EIA, for which, however, we do not have any other findings in the small trenches investigated so far. The LPG phases with the loomweights and the terrace of trench B1 are covered by the top soil, formed as a result of deep ploughing. This very thick layer contained pottery, coins and other small finds of various date, from the Late Archaic through the Hellenistic period (fig. 15). Surface finds prove that an extended settlement existed also during these later periods. It is very probable that building remains of these periods are still preserved at some locations of the site. However, at present the finds from the hill surface do not hint at any use of the site during the Roman period but there are some sporadic sherds and coins from Byzantine times (fig. 16). Most of the medieval findings were detected on the western, highest part of the hill. Understandably, this first preliminary report can only give very limited information on the prehistoric and historic periods of use of the Kástro hill southeast of Neokaisária. 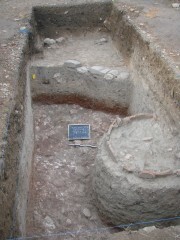 However, even the small initial excavations reveal some of the huge potential that the Adhrianós region has for filling the serious research gap concerning the settlement history of Pieria through the Bronze and Early Iron Ages, as Kástro Neokaisárias is the first settlement site of these periods investigated in the region. We sincerely thank the town of Kateríni and its mayor, Sávvas Chionídis as well as the vice-mayor of culture Ánna Athanasáki, for providing a storeroom and manifold help of every kind. The mayor's personal interest has been a great support for our archaeological research in the region. We are indebted to our colleagues Eva Alram-Stern and Barbara Horejs, the Flight Club Makedonia and personally the pilot Yórghos Papadhimitríou, the field owner Mr. Sakóghlou and the topographer Sokrátis Konstantínou for their many and various help, valuable suggestions and discussions. Last but not least, the campaign at the Adhrianós region owes much to the contributions of Chrístos Rafailídis, who found and organized the store- and study room and took part in the organization of the excavation and in the dig itself. 1 The inscription was found by Christos Rafailídis during the excavation campaign of 2007 on the southern slope of the hill amongst the river pebbles of a huge pile of stones. These stones derive from the ancient buildings of the settlement and were piled there by the owner of the field plot in his effort to “clean” the field, which occupies the flat surface of the hill. An analytical publication of this inscription is being prepared by Evaggelia Marki. 2 This is proven by unpublished finds from the Double Trapeza of Sindos and Karabournáki. Plutarch’s Lives VI. Dion and Brutus, Timoleon and Aemilius Paulus. The Loeb Classical Library. London (1970). Alram-Stern, E. 2004. Die Frühbronzezeit in Griechenland. Mit Ausnahme von Kreta. Die Ägäische Frühzeit 2. Serie. Forschungsbericht 1975–2002. 2. Band, Teil 1. Veröffentlichungen der Mykenischen Kommission 21. Vienna. Alram-Stern, E. 2006. Aigeira I. Die mykenische Akropolis. Fasz. 3. Vormykenische Keramik, Kleinfunde, archäozoologische und archäobotanische Hinterlassenschaften, naturwissenschaftliche Datierung. Veröffentlichungen der Mykenischen Kommission 24. Vienna. Andreou, St. 2000. “Σίνδος: αποθέτης κεραμικής της Πρώιμης Εποχής του Σιδήρου.” ArchDelt 51–52 A', 1996–1997 (2000): 51–84. Andreou, S., M. Fotiadis, and K. Kotsakis 2001. “Review of Aegean Prehistory V: The Neolithic and Bronze Age of Northern Greece.” In: Aegean Prehistory. A Review, edited by T. Cullen, 259–327. AJA Supplement 1. Boston. Aslanis, I. Kastanas. Ausgrabungen in einem Siedlungshügel der Bronze-und Eisenzeit Makedoniens 1975–1979. Die frühbronzezeitlichen Funde und Befunde. Prähistorische Archäologie in Südosteuropa 4. Berlin. Catling, R. W. V. 1998. “The typology of the Protogeometric and Subprotogeometric Pottery from Troia and its Aegean context.” Studia Troica 8: 151–187. Christmann, E. 1996. Die deutschen Ausgrabungen auf der Pevkakia-Magula in Thessalien II. Die frühe Bronzezeit. Beiträge zur Ur- und frühgeschichtlichen Archäologie des Mittelmeer-Kulturraumes 29. Bonn. Desborough, V. R. d’A. 1979–80. “The Dark Age Pottery (SM–SPG III) from Settlement and Cemeteries.” In Lefkandi I. The Iron Age. The Settlement, the cemeteries, edited by M. R. Popham, L. H. Sackett, and P. G. Themelis, 281–354. The British School of Archaeology at Athens Supplementary Volume 11. Oxford. Evely, D. 2006. 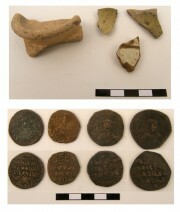 “The Small Finds.” In Lefkandi IV. The Bronze Age. The Late Helladic IIIC Settlement at Xeropolis, edited by D. Evely, 265–302. The British School at Athens Supplementary Volume 39. Oxford, Northampton. Gimatzidis, S. 2006. Die Stadt Sindos. Eine Siedlung von der späten Bronze- bis zur Klassischen Zeit am Thermaischen Golf in Makedonien. Unpublished PhD thesis, Freie Universtität Berlin. Institut für Ur- und Frühgeschichte. Gimatzidis, S. In press a. “The Northwest Aegean in the Early Iron Age.” In The “Dark Ages” Revisited. An International Conference in Memory of William D. E. Coulson, Department of History, Archaeology and Social Anthropology, University of Thessaly, Volos, Greece, 14–17 June 2007. Gimatzidis, S. In press b. “Πρώιμοι ελληνικοί εμπορικοί αμφορείς.” In Thasos. Métropole et colonies. Symposium International à la mémoire de Marina Sgourou, 21–22 septembre 2006, Musée Archéologique de Thasos et «Καλογερικό» de Thasos. Hänsel, B. 1989. Kastanas. Ausgrabungen in einem Siedlungshügel der Bronze- und Eisenzeit Makedoniens 1975–1979. Die Grabung und der Baubefund. Prähistorische Archäologie in Südosteuropa 7. Berlin. Hochstetter, A. 1987. Kastanas. Ausgrabungen in einem Siedlungshügel der Bronze- und Eisenzeit Makedoniens 1975–1979. Die Kleinfunde. Prähistorische Archäologie in Südosteuropa 6. Berlin. Horejs, B. 2007a. “Macedonia: Mediator or Buffer Zone between Cultural Spheres?” In: Between the Aegean and Baltic Seas: Prehistory Across Borders. Proceedings of the International Conference Bronze and Early Iron Age Interconnections and Contemporary Developments between the Aegean and the Regions of the Balkan Peninsula, Central and Northern Europe, University of Zagreb, 11–14 April 2005, edited by I. Galanaki, H. Tomas, Y. Galanakis and R. Laffineur, 293–306. Aegaeum 27. Eupen. Horejs, B. 2007b. “The Phenomenon of Mattpainted Pottery in the Northern Aegean” <http://www.aegeobalkanprehistory.net/article.php?id_art=8> (Oct. 3rd 2007). Jung, R. 2002. Kastanas. Ausgrabungen in einem Siedlungshügel der Bronze- und Eisenzeit Makedoniens 1975–1979. Die Drehscheibenkeramik der Schichten 19 bis 11. Prähistorische Archäologie in Südosteuropa 18. Kiel. Rahmstorf, L. 2003. “Clay Spools from Tiryns and other Contemporary Sites. An Indication of Foreign Influence in LH IIIC?” In: Β' Διεθνές Διεπιστημονικό Συμπόσιο «Η Περιφέρεια του Μυκηναϊκού Κόσμου», Λαμία 1999 / 2nd International Interdisciplinary Colloquium "The Periphery of the Mycenaean World", Lamia 1999. Πρακτικά / Proceedings, edited by N. Kyparissi-Apostolika and M. Papakonstantinou, 397–415. Athens. Tiverios, M. 1996. “Επτά χρόνια (1990–1996) αρχαιολογικών ερευνών στη διπλή τράπεζα Αγχιάλου-Σίνδου. Ο αρχαίος οικισμός”. AEMT 10 A: 407–425. Stefanos Gimatzidis, Reinhard Jung, "Kastro at Neokaisaria: A Bronze and Early Iron Age Settlement in Pieria, Macedonia." 3 Aug. 2008. In: Horejs, B. - Pavúk, P. (eds. ): Aegean and Balkan Prehistory. http://www.aegeobalkanprehistory.net/index.php?p=article&id_art=14 (23 Apr. 2019).